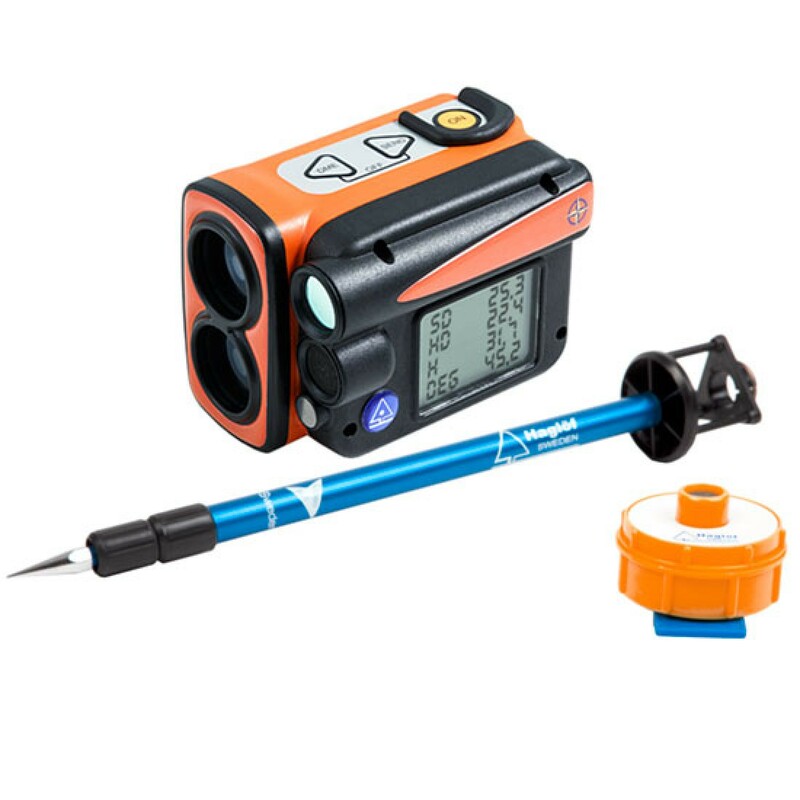 The Vertex Laser Geo has the samefunctionality as the Laser Geo but with the added feature of ultrasoundmeasurement which is particularly useful in forestry mensuration where thetarget to be measured is obscured by undergrowth etc. It is anexcellent choice of instrument for measurements of trees and in the utilityindustry, general surveying etc. This laser/ultrasound device with inbuilt GPS& compass can measure distance, height & canopy of trees, border treesand safety distances. 3D powerline, 3D map area & 3D wood pile measurements(or other heaps) is also a simple operation with the Vertex Laser Geo. The VertexLaser Geo is an efficient instrument system in circular sample plot measuringand for reverse prism cruising. GPS and compass function incorporated ininstrument with accuracy down to <1.5 degrees RSME (Root Square Mean Error)and heads-up display for real-time measurement update. The builtin GPS-receiver and a 5-position numeric ID-attribute allow you to tagimportant data with coordinates with a simple key press. Your data is stored ona built in SSD drive and immediately available for further processing whenconnecting a standard USB 2.0 interface to any PC or Apple computer. Noinstallation routines, converting software or special drivers are needed. Yourfield data can be opened straight in your favourite GIS- or spreadsheetapplication. Complex operations such as area measurement, 3D mapping of targetsand Trail mapping have integrated functions that also are available to youwithout any external tools. The 3D Vector function allows you to measurehorizontal targets such as canopy width. Choose theVertex Laser Geo instrument system with incorporated ultrasound technology ifyour work mainly takes place in the forest. Ultrasound is superior compared toalternative methods, as it can be used in dense forests and where underbrush isthick. The Vertex Laser system works with an ultrasonic transponder. Use incircular sample plots to quickly and accurately determine if a tree is in orout of the plot! 3-point,2-point or 1-point or direct measuring - choose preferred method to work within the easy-to-follow menu system. A non-magnification dot sight helps you toidentify individual targets such as tree tops and power lines. Rechargeable Li-Ion 3.7V, built-in, approx. 2000 measu­rements. Charging time max 3.5h. USB mini B interface wall charger 110/220AC/5VDC; car charger adapter 12VDC. Cable Usb mini B Male/Usb Type A Male, 0.5m. Consumption max 0.9W. IR, Bluetooth® class 2, Spp (serial profile), pin-code 1234, USB 2.0/SSD Disk. -20° to +45° C/ -4°F-113°F. 0-999 m/ft. Resolution height: 0.1 m/ft. -90° - 90°. Unit: Degrees 360⁰, Grads 400⁰ and %. Resolu­tion: 0.1⁰. Accuracy: 0.1⁰ typical. Distance: 30 m/98 ft. With 360° adapter: 20 m/60 ft. Ac­curacy distance: 1% or better typical. Resolution distance: 0.01m/0.1ft. Distance: 46cm/1.5ft - 700m/2000ft depending on target. Accuracy: 4cm/0.1ft typical. Resolution: 0.1m/ft (0.01m/0.1ft in DME-mode). 33-channel high sensitivity receiver. Supports GPS, Glonass, Galileo, QZSS. Built-in real tme correction w SBAS (EGNOS, WAAS, MSAS, GAGAN) Accuracy down to 2.5m/8.19ft in open terrain. Satellite position prediction for up to 3 days. Host Based multi-global na­vigation satellite system GPS(USA)/GLONASS(Russia)/Galileo(EU)/QZSS(JAPAN) SBAS Satellite-based augmentation systems: WAAS(US) EGNOS(EU) GAGAN (India) MSAS(Japan). Built-in self-generated orbit prediction (Faster TTFF up to 3 days), built-in jamming removing. Accuracy: Automatic position 2.5m CEP (circular error probable) (50% 24 hr static, -130dBm. Speed 0.1m/s (50%@30m/s. Azimuth compass 0-360˚, resolution 0,1˚, accuracy <1.5 RSME˚. MIL-STD-810E. Housing frame material glass filled poly carbonate, IP67, NEMA6, Laser class 1, 7mm (FDA, CFR21) Class 1m (IEC 60825-1:2001). Red dot aim 1 x magnification. External Graphic LCD 100x60pixles. Internal Heads-up display. Nmea or Ascii. IR, Bluetooth. CSV and KML Google Earth. Other in­formation, details, accessories etc. Monopod staff with foot bracket for steady aim. Transponder T3 for ultrasound measuring (1 ea AA 1.5V alkaline battery necessary for T3, power consumption 9mW). Adapter and monopod staff, 4-parts (33-140cm) weight approx. 270g/9.5oz. Aluminium transport/storing case. See user manual for more details.